Wind – CURSED! Storm in the U.S. = winds in Baja. They were back again. Maybe only 2 days this week not windy. One day winds were gusting 20-25 knots and the port captain shut everything down in La Paz. No boats in or out . 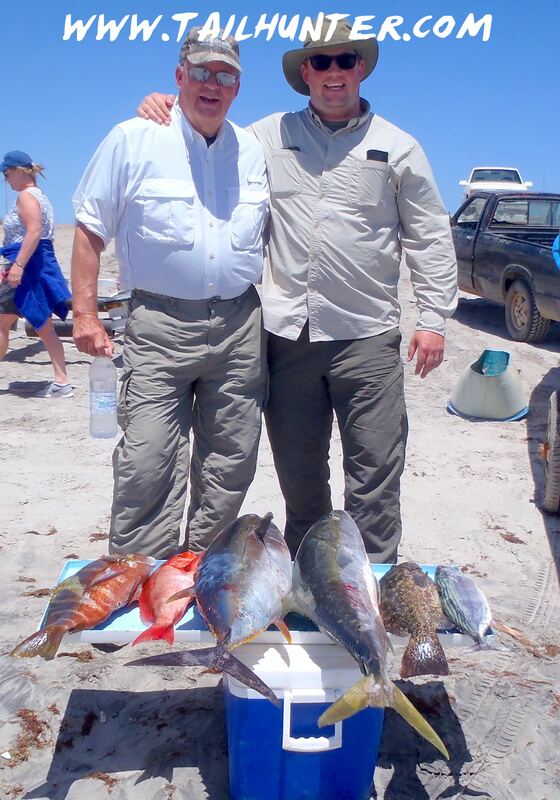 Fortunately, we have our Las Arenas fleet and our folks were able to fish, but it was still a difficult effort. Water – Warming, but with the winds, there were strong currents and big rollers at time. Even crashing surf here in La Paz Bay which is highly unusual. On the days the wind was not blowing the waters were really turned up and cloudy from the winds. Fishing – Dictated by the winds. Better fishing on days when it was less windy. Hard to get bait also when it’s windy. Catching – Nice variety. Some tuna, dorado, yellowtail, several species of pargo and snapper, cabrilla and some hefty white bonito. 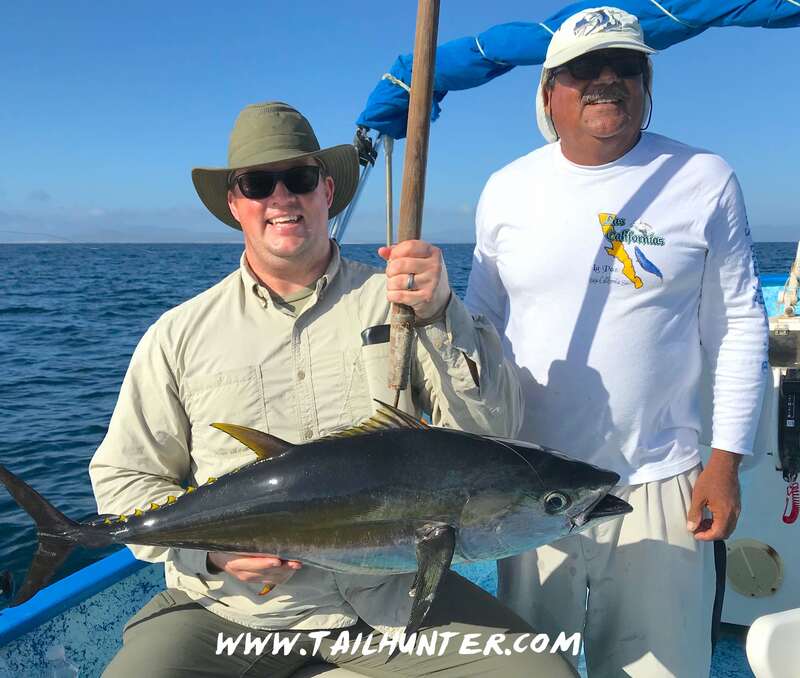 LAST MINUTE FLASH – Just as we were going to post this report and too late to make changes, we had a great dorado bite take off. Go figure! Will have more in next week’s report. 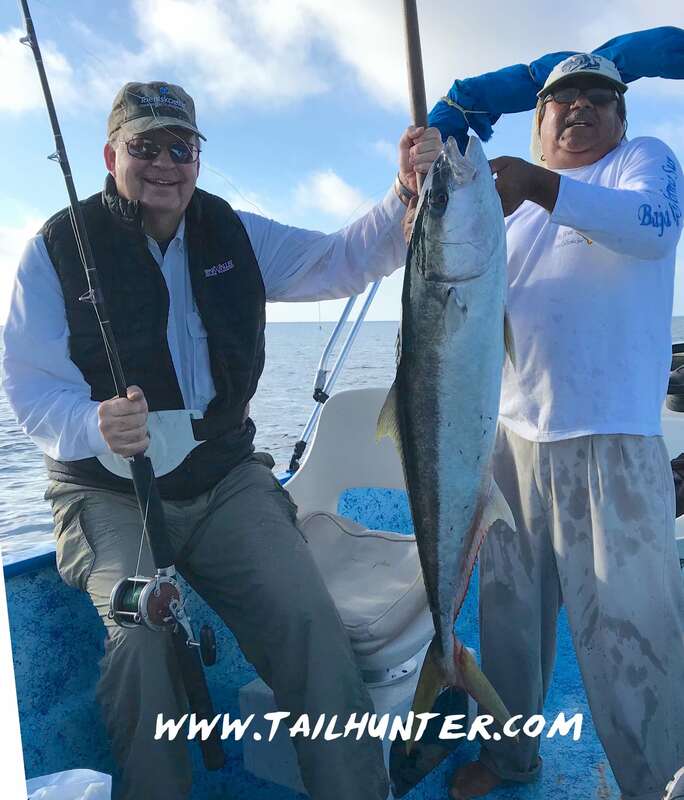 Not sure how much longer there will be yellowtail in the water with waters getting warmer, but this forktail didn’t know that and got hammered by Chuck Toeniskoetter. 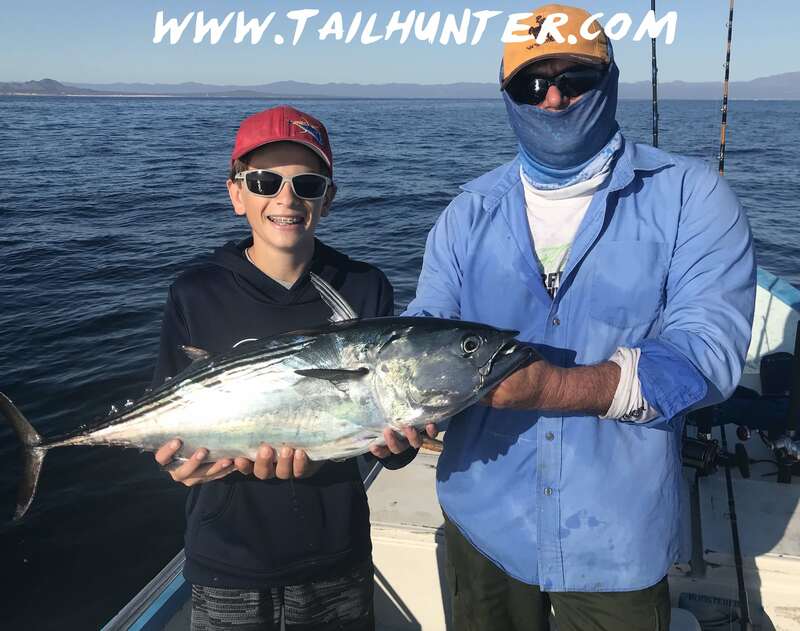 Chuck Toeniskoetter and son, Adam, from Los Gatos CA try to come down to La Paz at least once a year to fish and did relatively well despite tough conditions while fishing, once again, with the Tailhunter Fleet. This one day rack of fish shows an incredible variety including yellowfin tuna, a big yellowtail, a nice cabrilla, white bonito, pargo mulatto and a red snapper. 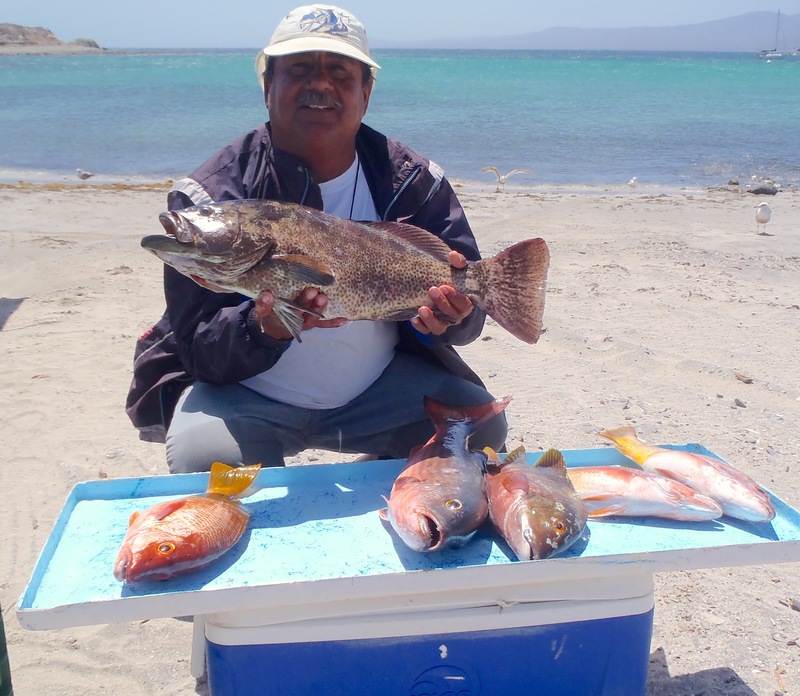 Captain Victor with a big cabrilla and some great reef fish including pargo liso, barred pargo and huachinango. You remember the thrill? Big bonito for 12-year-old Nick Genovese with Captain Armando. He also had a big tuna on for awhile. Sweet yellowfin tuna for Adam Toeniskoetter. Couldn’t be any nicer folks! 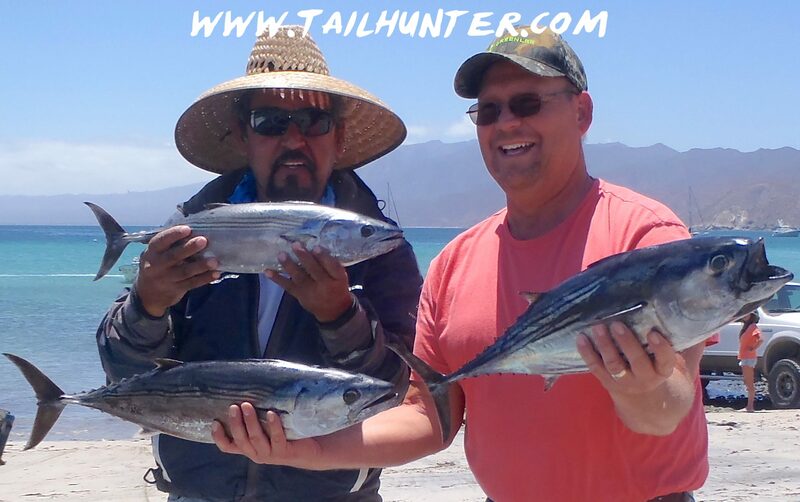 Steve Friemark with a handful of tasty white bonito and Captain Jorge on the beach at Muertos. Basically, as long as storms keep showing up in the U.S., it’s going to affect things in Baja and the Sea of Cortez! So, it wasn’t the greatest week for fishing. There was some variety, but not much for quantity although some days there was some great action on some pig bonito. Not only good fighters, but these are “white bonito.” (Bonito Diente). They have teeth, but also have some incredible great white meat for table fare. Most folks would not be able to tell it from tuna. In addition, we did have some 15-30 pound yellowfin tuna show up around Cerralvo Island and some larger that were lost after long battles. But, the issue is getting across the channel to the island. If there’s wind and rollers happening then getting across to the island (and to get sardines) is pretty futile. But, inshore offered alternatives like several species of pargo including pargo mulatto (barred pargo); pargo liso (mullett snapper); cubera snapper (pargo perro/ dog-tooth snapper) as well as red and yellow snapper (huachinango). We also got some action off cabrilla (seabass) and some decent triggerfish and jack crevalle. Honestly, however, not the best fishing and kudos to our anglers who hung in there and grinned through it all the kept smiling. But, one reason, not many folks are fishing this early in the season. BUT WAIT…Just as I was posting this up but too late to make changes, we had dorado go off in La Paz Bay! Go figure . I’ll have more on that in the next report!